Water fleas belong to the Crustacea, a large group of 'jointed limbed' animals, most of which live in water. 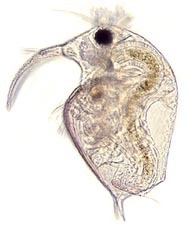 Water fleas are placed in the order Cladocera <see footnote> and are probably called 'fleas' because they move through the water by a sort of hopping. Water fleas are very common in fresh water, in Britain you can find about 80 different species, in The Netherlands about a 100 species. Many of them are rare. For most people, water fleas are all similar, but when we look more closely, big differences will be found in morphology and in habits. 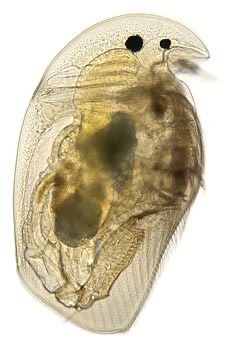 The chief characteristic of the water fleas is that the main part of the body is enclosed in a kind of shell, with the appearance of two lids, but made of one piece. They are interesting animals for the microscopist. Because you can see through them, you can study for instance the beating of the heart and follow the course of the blood cells round part of the body. Their sizes differ from several hundred microns to more than five millimetre for the larger species. 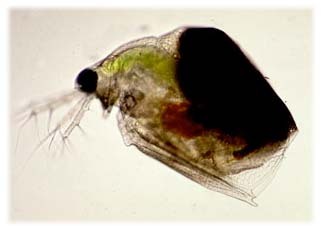 The common water flea, Daphnia pulex can be found in almost all sorts of eutrophic (rich in nutrients) waters. They reproduce in summer mostly parthenogenetic, that is, the eggs develop without undergoing fertilization. At the end of the summer, some of the eggs develop into the smaller males, capable of fertilizing the eggs in females, which then develop into the so called 'winter eggs'; mostly only one or two are present in the females. These eggs can also be found in populations under stress, such as during the drying up of a pond. 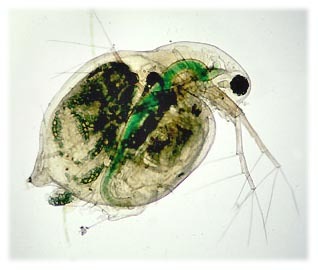 Daphnia feeds on bacteria, fine detritus and very small algae. But not all water fleas are peaceful herbivores. Some species are voracious predators. Go to the next page where you can see Polyphemus pediculus giving birth. Only some species inhabit marine waters. They differ considerably in appearance from their freshwater relatives.The following page shows some interesting stages in the development of Podon and Evadne Water fleas are beautiful creatures to observe through the microscope. Go to the following page to see them photographed in dark field illumination. Editor's footnote: The classification of the cladocera has been subject to review recently by taxonomists. See, for example, the Cladoceran web site run by the University of Guelph which summarises the current status of their taxonomy. Comments to the authors Jan Parmentier and Wim van Egmond are welcomed.